Curried Coconut-Butternut Squash Soup...and some thanks. Butternut Squash. What to do with you? Recall if you will, my recently begun expedition into the wide world of squash...in all of its glory. Switch gears. I needed soup today...ah, the days when I used to make soup at least once a week...where did you go? I miss you dear, comforting friend. Switch gears. While flipping through Mark Bittman's Kitchen Express I decided I would make soup this morning...so that I could refill my bowl all day long. Bring it all together. And there just happened to be a soup recipe that used Butternut Squash in there...two birds, one stone! Curried Coconut-Butternut Squash Soup from Mark Bittman's Kitchen Express Cook two cups of chopped squash in a few tablespoons of vegetable oil, along with a diced onion, a teaspoon of curry powder (yay, another use for my homemade curry powder), a teaspoon of cumin and a half teaspoon of cinnamon. Cook the vegetables and spices until the onion is soft, about 3 minutes. Add five cups of chicken broth or water and a cup of coconut milk; bring to a boil and cook for about six minutes or until the squash is tender and easily pieced with a knife. So, I began by peeling a butternut squash. I used an ice cream scoop to make quick work of the few seeds. I sliced it to get it ready. Then I diced it for use in the soup. Chop an onion and add it with the squash and spices to the heated oil in a soup pot. Once the onion is soft, add the liquids and simmer until tender...not very long! I decided to puree about 3/4 of the soup because I wanted a bit more body than was there. Then I added sea salt and black pepper. I also cooked up some brown rice and added it to the bowl before ladling in the soup. Simple and pretty darn quick. Next time I'll add more seasoning...because it was quite bland...but the flavors did develop more over time. Mix it all up... ...and dig in. I bet it'll be even better tomorrow! I am submitting this to Deb of Kahakai Kitchen for Souper Sunday! A big thanks to the uber-funny Alyssa (& new mama) of Angel in the Kitchen for passing me this awesome award! And another big thanks to my pal Miranda of My Food and Life Encounters (who is currently cooking..quite successfully..from her extended stay suite while in between homes!) for passing me these awesome awards! Wow what a beautiful soup! I have yet to try butternut squash (I know!) so this would be a great start! P.S. Did you ever figure out the name of that squash you picked up awhile ago? You made the pasta with it. Heather, to me this is so healthy and warming. When you say it was sort of bland, I suppose the rice absorbed the flavor of the soup leaving it a bit light in flavor. Although having the rice stired in like that looks so comforting and is definitely the best way to have it. this soup looks real hearty and comforting...and yes its going to be real good..real good I mean to be able to have soup every week. I have never had butternut squash soup...sighs....this looks so good, so heartwarming and healthy..you know, kind of a soul food. Mmmm, looks and sounds yummy. I don't think I've ever had anything quite like it. Sounds perfect for a chilly winter day! NN...thanks...I'm still playing with it. I can't seem to pin down "that perfect header" yet...but it'll work for now :) And NO!! Sheesh, I haven't made it back to ask the farmer yet cuz work's been getting in the way. Will let you know when I do, though. ...and yes, good for the soul! 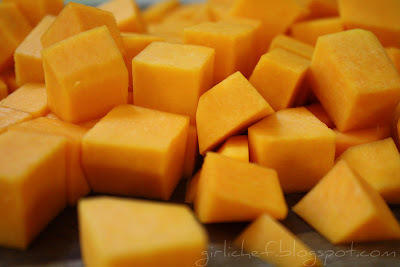 LOL_ the pics of the butternut squash look like yellow cheese ;D Can you tell I have cheese on the brain? Both you and Natashya made some cool and different looking butternut squash soups!! This curry version with the rice is very inticing. I just tried my first curry dish this past Friday night and now I'm hooked. After pie, the next best place for squash or pumpkin is definitely soup! This looks amazing. And now I'm hungry. Funny how that happens when I visit you here! I am so making this. 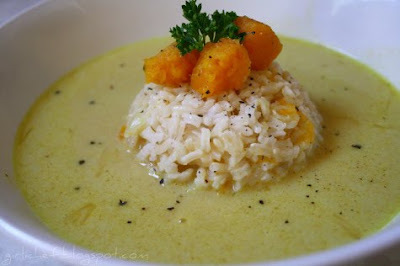 Love butternut squash, love curry, love coconut. And love Mark Bittman! Thanks for joining in Souper Sundays. Beautiful soup. I was going to get some squash from the farmer's market this weekend, but they didn't seem too appetizing. hopefully they'll have some good ones next week. Soup sounds good right about now. The weather is just perfect for it. ps. Love the new header. mmmmmm.......soup. It looks so good and comforting. I love the presentation of this soup! very elegant and I think its perfect with rice too! Love these flavors. I am a huge fan of butternut squash!!! 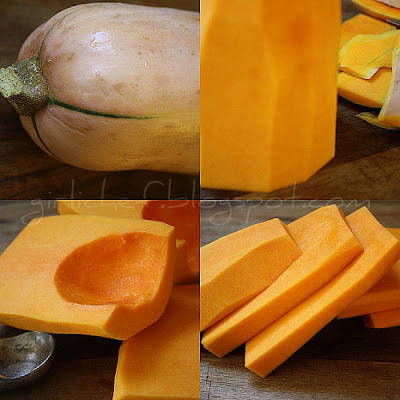 My boyfriend and I have plans to make a butternut squash soup sometime this week. I like the idea of using coconut milk. We already use curry spices, so this will give us a nice way to switch things up. All I know is that it looks good to me. Did you mention how big the squash cubes are. I am too tired to look back now. I will come back. I have been making "orange" soups but I have been combining orange veggies. I have not tried a stand alone butternut squash. You are definitely motivating me and I have squash in the house. I made one with sweet potatoes that was good. It might have been by Tyler. 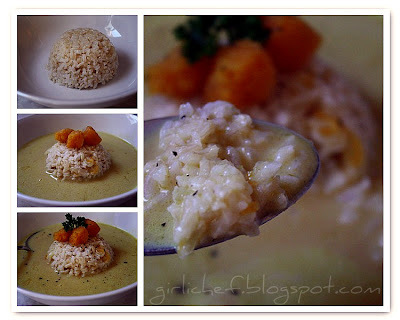 It is fun to play around with soups. They are so versatile. I have this butternut squash soup recipe that I use year after year. It's really good...but this looks even better! I love the addition of curry and brown rice. Yum! i like the new picture and header. I have to admit I am holding off on soup still as I hope to hold onto the warm weather. this is such a great combination of GREAT foods! mmmmm, delicious! Now that's a beautiful soup! 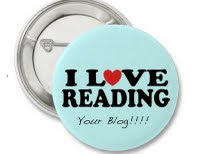 So glad you popped by to visit my blog. You've got some great recipes, here! This looks fantastic. The photo with the little island of rice is mouth watering!! I love the idea of the brown rice put in the plate! I was eying butternut squash at the grocer's this past week and decided against it because I didn't know what to do with it besides eating it plain. Should've brought it home! Gorgeous! I love butternut squash, so versatile. Great idea to add the brown rice. This looks wonderful. It's so odd you would post this. I was at Williams Sonoma yesterday and they were serving up samples of a delicious Butternut Squash curry soup. They were selling thier Butternut Squash Puree for $12. Even though Butternut Squash is so ornery to peel/chop I decided not to buy it and try my own. And by the way, thanks for stopping by my blog. Always love the feedback. That is a beautiful and delicious soup! I love cooking with coconut milk. I'm a big fan of butternut squash in any form but I've never combined it with coconut milk. Sounds like a delicious soup. I'm with you on the curry! This looks incredible! I know I'd love it. 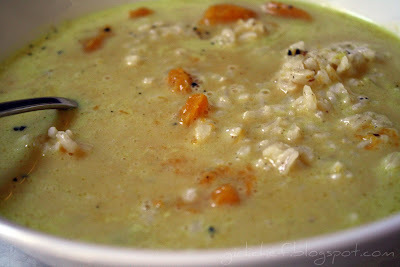 I'm loving this combination of butternut squash, coconut & curry - what a terrific soup! 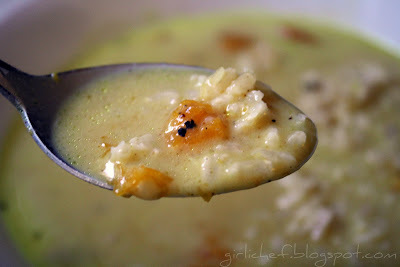 OH my....this soup sounds so good especially on this chilly fall morning! Love the addition of the rice! 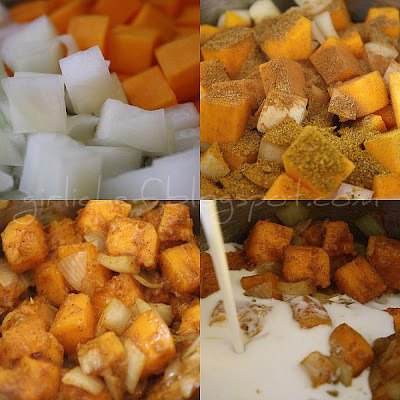 I'm posting a version of butternut squash soup today, must be that time of year! Your site is fantastic, I enjoyed browsing. I just a butternut squash today! I can't resist curry and coconut together! I love the new header! Very nice! One of the most stunning soups I've seen. Sounds good as well. Ah, I love curry. This looks and sounds wonderful. I've put it on my hit-list. I love soup! Love this soup! That is one gorgeously presented bowl of soup! Heather this looks terrific, I love butternut squash soup, this one is different from the two I've made before, can't wait to try it out! mmmmm coconut and squash - this soup probably tasted great the next day! I love all the flavors in here! And you know how much I love squash! I would be happy to eat this all day long! This sounds like a fantastic bowl of soup. You have a knack for making the best sounding recipes. I love using squash for soup, and this sounds like a real winner! That sounds so good and I LOVE your presentation with the scoop of brown rice in the middle! Gorgeous presentation. I like squash actually, great in soups, stews and even risotto! Beautiful soup and presentation! This is definitely our kind of soup and a nice change from the pumpkin soup I always make! vat a magnificent soup!! m loving the combination!! Aw, thanks for the thanks! The award is very much deserved. And the soup looks luscious! Love the texture that the rice creates.